"When it rained, he had to sit in certain spots so the rain wouldn't pour in on him," said Mike Graham, about his neighbor's camper. "He had no running water, no heat, no nothing." 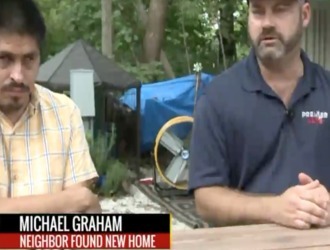 Graham decided to take action and organized getting his neighbor, Alex Bustos, a new camper. Bustos, who is visually impaired, had already been receiving assistance from Graham in the way of groceries, accounting, and trailer repairs. Mike decided that Bustos home was too far gone for repair. If you are visually impaired and need assistance, please contact SDCB. We offer several programs that can improve your life quality.